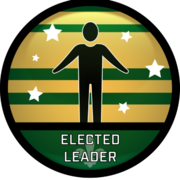 To earn this badge, students must successfully serve as an elected member of one or more governing organization for at least one semester. At St. Norbert College, we place a premium on leadership of all kinds. The "Citizen Leader" badge is awarded to specifically recognize the contributions of students serving their peers as elected members of governing organizations' executive teams: Student Government Association, Residence Hall Association, Interfraternity Council, Panhellenic Council, and Independent Council.